Note: this workshop has already taken place. Workshop presentations and summaries of discussions are available on the program page; posters are available on the posters page, and activities are available on the activities page. Volcanic activity provides an excellent demonstration of the dynamic nature of the Earth and is among the most popular Earth Science topics. To capitalize on the high visibility of volcanic activity, the U.S. Geological Survey's Hawaiian Volcano Observatory (HVO), in collaboration with the National Aeronautics and Space Administration (NASA) and the University of Hawaii at Manoa (UHM), launched the Volcanoes Exploration Project: Pu`u `O`o (VEPP). The central feature of the VEPP is a Web site that provides data collected by continuous instrumentation and campaign surveys from the Pu`u `O`o eruptive vent on the east rift zone of Kilauea Volcano, Hawaii. Monitoring data that will be available through the website include GPS, tilt, gravity, and seismic amplitude time series, kinematic GPS campaign measurements, and imagery from fixed webcams. 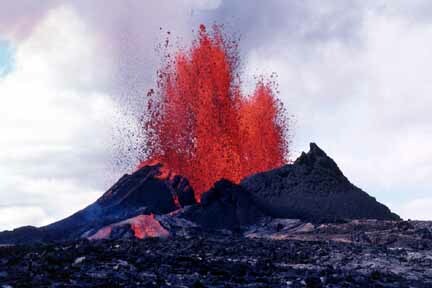 Pu`u `O`o has been active almost continuously since 1983, and experiences a wide range of eruptive activity. In addition to hosting multiple interfaces that provide a platform for interacting with and manipulating geophysical and geologic data collected from Pu`u `O`o, the Web site will provide background information on volcano monitoring, the history of the Pu`u `O`o eruption, and a password-protected area for instructors to share ideas on how to utilize the Web site. To promote awareness and use of the VEPP Web site for the college classroom, as well as suggestions for improvements and modifications, a workshop for college and university Earth Science instructors will be held at Kilauea Volcano in 2010. Interpret each of the VEPP data types (Continuous GPS, Kinematic GPS, Ground Tilt, Seismic, Webcams, Gravity). Be proficient in the use of the VEPP Web site and will create a teaching activity. Describe the history of and current eruptive activity at Pu`u`O`o. Incorporate innovative teaching approaches in their classrooms. Promote the use of the VEPP Web site in college and university geoscience courses. Provide feedback on the structure and content of the VEPP Web site. The workshop will be held Monday, July 26 through Friday, July 30, 2010. Attendees should plan to arrive in Hilo, HI (on the Big Island of Hawaii) by 5 PM on Sunday evening (July 25), and should schedule departures for Friday night (July 30) after 6 PM or Saturday morning (July 31). Over the course of the five days of the workshop, attendees will spend parts of 2-3 days in the field, learning about volcano monitoring data/techniques and examining volcanic processes/products. Other days will be spent in a classroom setting (including small group work), developing exercises that make use of the Web site in college and university courses. Before the workshop - familiarize themselves with the VEPP Web site, formulate ideas for how the Web site might be utilized in the courses they teach (this will include submitting outlines or essays describing sample exercises as part of an advanced registration for the workshop), and prepare for an opening-evening exercise on volcano monitoring. During the workshop - participate in all aspects of the workshop, including group work to design curricula that make use of the VEPP Web site and will involve some evening activities, provide feedback and suggestions on the nature of the Web site, and submit completed exercises for distribution (initially via the Internet). After the workshop - participate in follow-up activities (for example, special sessions at meetings or articles in academic and/or educational journals) and become advocates for use of the Web site within the geoscience academic community. Participants are responsible for their own airfare to and from Hilo, HI. Food and accommodations (private bedrooms in shared suites) will be provided at the Kilauea Military Camp from Sunday evening (July 25) to Saturday morning (July 31). Owing to U.S. Government regulations, participants will have to pay for these expenses upon check-out, but will be reimbursed in full by the U.S. Geological Survey via direct deposit within 1-2 weeks of the end of the workshop. Participants may arrange for their own accommodations, but will be responsible for the associated costs (there are a variety of Bed and Breakfast options in Volcano Village, about 2 miles from the workshop location). Any participant wishing to spend additional time in Hawaii, or planning to bring an accompanying person, will be responsible for associated costs (the lodging cannot support accompanying persons). Transportation between the airport and conference site, and for field exercises, will be provided. Any college or university instructor that teaches a geoscience or related course is eligible to apply. Attendees will be selected based on their past experience and demonstrated success in designing innovative classroom exercises, as well as the types of courses they teach. The final list of participants will reflect the diversity in classroom types (e.g., large introductory lectures to small graduate seminars) and university types (e.g., 2-year colleges to research universities). The workshop will be held at the Kilauea Military Camp (KMC) in Hawaii Volcanoes National Park. All workshop activities will take place in a conference room at KMC, which is equipped with a projector for displaying Powerpoint presentations and other information. Accommodations will be in multi-bedroom cottages and apartments at KMC, and each participant will have a private bedroom. Breakfast, lunch, and dinner will be served at the KMC cafeteria except during field excursions, when boxed lunches will be provided. KMC amenities include a store, lounge, bowling alley, and recreation lodge, and the facility is located within walking distance of National Park Service trails and visitor centers around Kilauea caldera.